I really liked this unusual book. 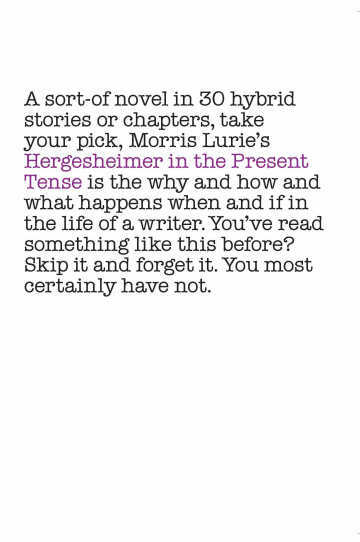 Morris Lurie’s Hergesheimer in the Present Tense defies easy categorisation. The media release calls it short stories, while the book-cover calls it a sort-of novel. It consists of 30 vignettes featuring a cantankerous old author who’s at war with his publisher, his ageing typewriter, his would-be lover Valerie, and, well, the world in general. It’s such a clever title! It is indeed the present that makes Hergesheimer tense. While there are many amusing moments in the book, there are poignant moments too, and a sense that Hergesheimer is losing the battle to keep up with the modern world. It’s moving too fast for him, and the values by which he’s lived his life don’t seem to matter to people any more. These are famous footsteps I’m treading in here, he lets you know. For instance, your thieving Mr Shakespeare, to select an example, common knowledge he wasn’t one to leave a good storyline alone. Oh, I see, growing your flowers in another man’s plot? Hey, that’s good, cries the plagiarist. Mind if I use it? Hergesheimer’s not comfortable with the expectation that these days writers are expected to ‘perform’. He gets sent on publicity events that test his patience to the limit, and he’s peeved by the celebrity status accorded to more popular authors that he obviously thinks are not worthy of such acclaim. Having stumbled into writing some successful books for children, he has to go on the schools’ circuit where his jokes fall flat and he gets ticked off by an eight-year-old for not having love in his story. Indeed, his most long-lasting relationships are with things. He flees his marriage in a twenty-four-year-old car… … that nice green that was popular with bathrooms just after the war . Yes, it’s old but he’s fond of it and he doesn’t like the idea of selling it to avoid paying tax. Show me a man without tantrums and I’ll show you a man without blood. Hergesheimer, that most gentle of souls, peacefully writing a tender memoir of cloudless and blissful childhood days, mistypes the word malfeasance for the seventh time in a rotten row, rips the ruined page from his cursed machine with such sudden savagery that whoops a vital perspex part snaps and shoots broken forever from the pale green Swiss made Hermes 3000 manual typewriter for forty and more stalwart years his trusty tool. Or can it be glued? Hergesheimer has inherited his father’s fingers. His telephone book discloses typewriter repairs in some remotest of far-flung suburb. Hergesheimer flying there at once. His framed and displayed foreign diploma of typewriter technicianship notwithstanding, he is now with television aerials, he tells Hergesheimer, somehow simultaneously proud and sad, well, what can you do, you have to move with the times. Hergesheimer, could he come back possibly tomorrow? he’ll manufacture for him a replacement, should be the solution, no? Hergesheimer in the Present Tense is a glimpse into the life of a n older man who seems beset by difficulties large and small, but it’s not depressing because of the droll style and the self-deprecating humour. And I love the Yiddish sentence constructions – this is the English that I heard all around me when I was child growing up in Caulfield, and it brings back memories of the nicest neighbours I ever had. Check out the review at the SMH too. Hey, Stu, I’ve just discovered that there’s another one, Hergesheimer Hangs In, published in 2011. (There’s a description at GoodReads). So now I must track that one down. Gender notwithstanding, Hergesheimer sounds like me in disguise! I am definitely purchasing this one.